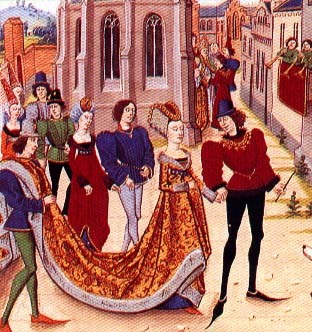 Always wanted to know what those splendiferous fabrics in the Fifteenth-Century paintings were like? I had a chance to find out. Here's a travelogue. Two weeks ago, I journeyed to Wisconsin, but on the way, my companions and I stopped at the Art Institute of Chicago, where they are in the process of having a show on ecclesiastical clothing (copes, dalmatics, etc.) They had clothing on display from 1310 to the present, but one the most interesting thing to me were the garments from the 1400s. I'm sure many of you have seen the various paintings and such during this period that show very large brocades -- by which I mean fabrics which appear to have design elements fully a foot across, and "repeats" of several feet (for those of you who don't 'do' fabric, this means 'how often does the pattern repeat itself'). I had often assumed that this was because the painter or tapestry weaver didn't want to paint umpteen little medallions, so they went for the overall effect. Judging by the actual fabric I saw, the painters were painting entirely to scale. They did have and use as clothing, fabric with larger motifs than we'd even put on a sofa today. 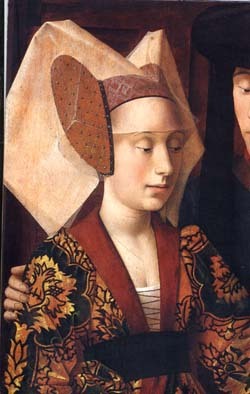 In general the brocades were of the thick vine and round medalion type; the best known examples I can think of from paintings which most folks can reference, are the tryptch of the Mystic Marriage of St. Catherine by Memling, 1479; or the St Eligius and the Lovers by Christus, 1449. As with the fabric I saw, these paintings show designs with repeats best measured in feet, rather than in inches, as most modern brocades use. The second thing that struck me was the actual composition of some of these brocades. Many of the paintings appear to be a yellow gold background with some sort of rich dark motif on them. This type of fabric is well represented in the exhibit; they are woven with a heavier metallic gold cord in the background (near the weight of a thin "couching" cord), and the dark bits are velvet. Some of the items were velvet of two colors; the one that comes to mind was of an entirely eye-popping bright red and bright blue -- colors of the sort you normally only see in books about optical illusions. There was also a smooth brocade which was a dark pink with gold polka-dots; the dots were about a half inch in diameter and about a quarter inch from each other. Many of the garments were pieced together with little or no concern for which way the pile or pattern was running. This may well be because the church was given a short length of cloth and they needed to eke it out, or because they were given a complete garment as a donation, and they had to work around the cut of the original item. Later (1700s+) garments were certainly done this way. Some of the gores and piecings were exceedingly small; one cope had a triangular section about .5" on the short side of the gore -- which was not longer than 2" altogether. On the other hand, some garments were not pieced, and some others had embroidery that was cleverly designed to follow the direction and use of the garment. (ie, radial embroidery motifs on a half-circle cloakish garment (cope). I suspect the museum usually only gets fabric fanatics down in the bowels of the building where the textile section is, for the guards did not seem to get at all nervous when I and my companions peered intently at the fabrics from about a 3" nose-to-fabric range. I was very happy at my nearsightedness, for I could remove my glasses for nearly-microscopelike close views; they were all displayed open to the air and to the visitors. 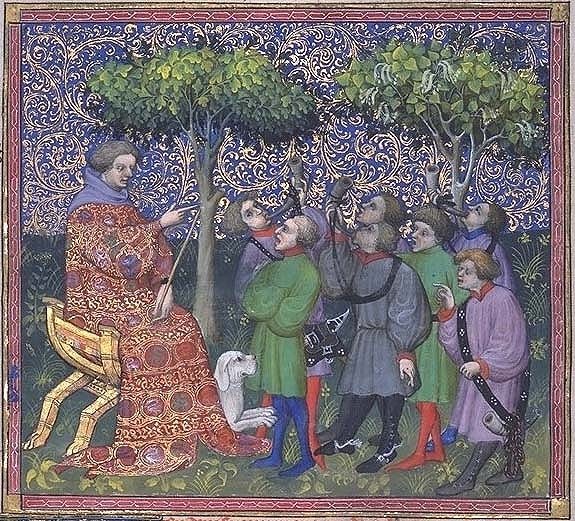 The conclusions that I draw from all this, and other illuminations that I have seen, is that those of us interested in recreating upper-class outfits need to use woven-patterned fabric far more often - silk or fine wools if we can get them; reasonable approximations if not. It's accurate, it's fun, and it looks good.